Between the attack in Charlottesville, the DOJ's request for information on visitors to the resistance site DisruptJ20, and anti-protester legislation under consideration in the PA Assembly, it's clear that some entities seek to limit our right to political expression - the underpinning of true democracy. Read on for ways you can defend your right to assemble and speak-out peacefully and safely. Support Anti-SLAPP Legislation in PA. Senator Farnese and Representative Bizzaro have sponsored bills SB 95 and HB 95 respectively. 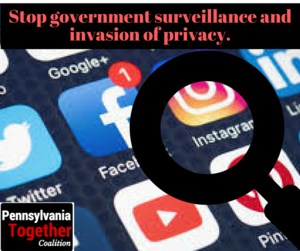 SB 95 has passed the PA Senate and has been waiting in the PA House Judiciary Committee for a hearing since April 26th. This bill would increase protections against Strategic Lawsuits Against Public Participation. These "SLAPP" lawsuits are brought against a person or organization in response to a position or statement regarding a rule or other matter of public interest, like a constituent protesting a decision by their representative. These lawsuits can have a chilling effect on public policy criticism due to the financial costs of defending against the suit. Share this graphic to your groups to spread awareness. Write to your PA House Representative and ask them to vote YES on SB 95. It is especially important that we reach House Judiciary Committee Chairs Marsico and Petrarca and ask them to move the bill out of committee for a vote on the floor. Click here to send a letter automatically. Feel free to use the text we have provided or write your own. 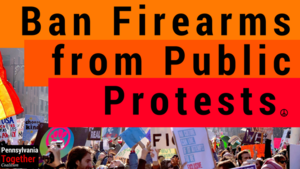 Ban Firearms from Public Protests. State Rep. Stephen Kinsey, D-Phila., announced his intention to introduce legislation prohibiting firearms and other dangerous articles at public demonstrations in Pennsylvania. Click here to read more. 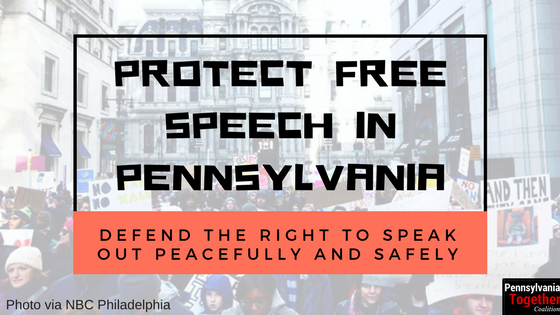 Write your representative and ask them to cosponsor this legislation and protect our right to practice free speech without threat of physical harm. Click here to send a letter automatically. Feel free to use the text we have provided or write your own. 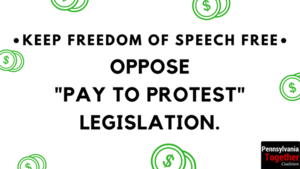 Oppose "Pay to Protest" Legislation -- PA Senate Bill 754. At least 19 states, including Pennsylvania, have introduced legislation meant to curb mass protest since the election of Donald Trump. Please click here to write to your representatives and tell them you oppose any efforts to prevent the exercise of free speech through financial penalties.